We rode our bikes up the Expo Center this weekend. 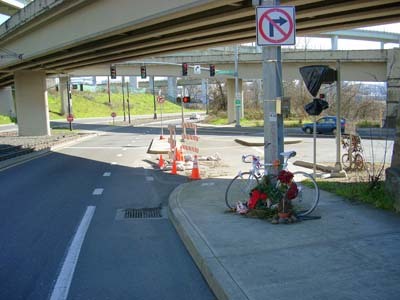 I chose a route that would take us through the Interstate + Greely intersection in order to get a sense about what happened there, and to see the ghost bike memorial. 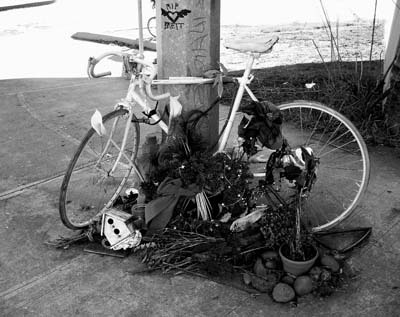 We did not know Brett, yet we are Portland bike riders, and as such, we all share some level of a common bond. I am glad to see that the bike still remains in place, and hope that it serves as a reminder to drivers and to riders, that we all have to be careful, alert and remember that we all share the roads. Right turns are now unlawful at this intersection. Maybe that will improve the safety of this intersection. There is no doubt that right turns are one of the most frequent areas of danger for the bicyclists. This entry was posted in Bicycling & Fitness on February 24, 2008 by golinielcomblog. We are riding in the Cycle Oregon Weekend Ride! This is going to be a shock for those that know us, but we are skipping the week long ride this year. Have ridden in 8 of the last 10 years, with two of those routes covering essentially all the miles of this years route, it seems as though this may be a year for us to look elsewhere for our bicycle miles. Make no mistake, the weekly ride this year is going be a very good one, as it goes through some very beautiful parts of Oregon. This ride is nearly sold out already, and will surely exceed the 2,000 rider limit. Crossing of the Astoria-Megler bridge. 4.1 miles in total length. The bridgeâ€™s main span is 1,232 feet in length, making it the longest â€œcontinuous trussâ€ in the world. Cycle Oregon usually creates safe options for biking, which may mean there will be some sort of bicycle only access to the crossing. Worth the price of admission right there. Some riding up into Washington, which we don’t do enough of. More riding around the coast regions. Due to traffic and some narrow roadways, riding in this area is much nicer to in groups. Less likely that inattentive drivers will be surprised by your existence. They are even going to set up and take down tents for us making the camping really easy. Lots of mileage options allows us to choose each morning what kind of bike ride we want for the day. Bike repair, SAG wagons,Police/Ambulance patrols, Entertainment, Showers, Massages, Beer Garden, on and on and on. This entry was posted in Bicycling & Fitness on February 23, 2008 by golinielcomblog. KINK radio is starting to dissapoint me. I listen to radio stations because I like the personalities. I can connect in some fashion to what they are saying or feeling, or that they feel is important. I get something of some small value out of that time I spend in the car. That is no different than choosing a station for the music that it plays. I have listened to KINK for 25 years, as the station has continually been connected to the lifestyle that is Portland. Off an on for most of those years, Rebecca Webb has been a part of theirs, and my, morning routine. For the last two weeks, Honey and have been wondering, just where is Rebecca? Now we learn, two weeks later, she has been released. That is really too bad, as will miss her small contribution to our daily lives. And one more thing.Â What is up with the thinking that the happenings on American Idol are news? Yesterday, I heard them talk aboutÂ that TV show in the morning and in the evening.Â Are daily TV shows news now? If so, there are much better shows to talk about. Lets talk about the mysteries, complexities and subtle connections to the real work, within in the show “Lost”. Or, lets talk about the real and challenging issues of growing up in a small town, in the show “Friday Night Lights”.Â But really, is American Idol, or any of the other comically mislabeled “reality show” really news?Â We have seen this thinly veiled self promotion for some time on nightly FOX news, as their anchors report on the news of American Idol, but hey, it is their show so I guess we will have to accept that if we want to watch what FOX tells us news. But KINK, arent you owned by CBS, a rival to FOX? This entry was posted in Social on February 23, 2008 by golinielcomblog. My position at work has changed focus slightly. A portion of my responsiblities have always included manually testing software produced by our developers. While I will still be including this testing amongt my other duties, a larger portion of my attention is to be directed towards coordinating our efforts in “Automation Testing”. This means finding ways to do large, difficult, or repetitive tasks programmatically, instead of manually. So, this means that maybe I need to create another blog to track, discuss and document what we have done and learned in this bold new frontier. This entry was posted in Tivos & Other Technology on February 21, 2008 by golinielcomblog. This is why it is so cool to be a Dane. If you enjoy a post-ride beer you may be increasing the heart-healthy benefits of cycling. A study in Denmark has found that drinking alcohol in moderation seems to have benefits similar to exercise. This research, reported in Time’s Feb. 4 issue, is significant in that it was conducted on 12,000 people over a 20-year period. It was found that exercise and drinking alcohol each had an independent beneficial effect on the heart. Mainly, an increase in good cholesterol (HDL) and the removal of fatty deposits created by bad cholesterol (LDL) in blood vessel walls. The study also determined that drinking and exercise combine to have a greater health benefit than either alone. The Danish researchers defined four categories and found that . . .
people who never drink and don’t exercise had the highest risk of heart disease. people who never drink but do exercise had a 30% lower risk. people who drink moderately but never exercise had a 30% lower risk. people who drink moderately and exercise had a 50% lower risk. A research team spokesman, Dr. Morten Gronbaek of Denmark>’s National Institute of Public Health, says the benefits of alcohol don’t kick in until you’re at the age — 45 to 50 — where heart disease becomes an appreciable risk. “There’s absolutely no proof of a preventative and protective effect before age 45,” Gronbaek told Time. Further, alcohol consumption is related to an increase in breast cancer among women, and anyone who has a family history of alcoholism should steer clear no matter what their age. The study imposed a limit of one drink a day for women and two for men. It did not distinguish among beer, wine and liquor. It calls for common sense in determining a “moderate” amount: a 12-oz. beer and a double martini are far different even though they fit in the same size glass. This entry was posted in Bicycling & Fitness on February 14, 2008 by golinielcomblog. Folks that work around the Lloyd Center area are serious about their bike commuting. And many work hard to promote cycling in the city. 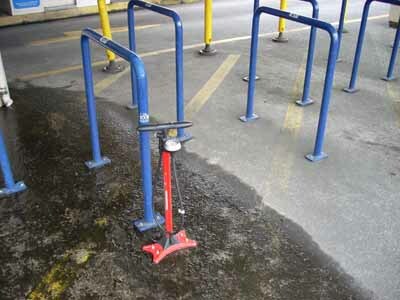 Someone has made the effort to bolt down a tire pump at the community bike rack, for anyone to use. Portland is a great town to ride a bike. This entry was posted in Bicycling & Fitness on February 13, 2008 by golinielcomblog. This weeks snow shoe trip started at White River canyon. 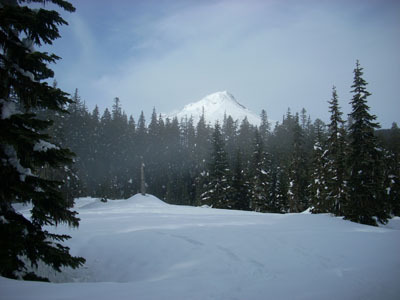 We hiked past the sledders to and begin our the trek up the canyon and immediately got a great view of Mt. Hood. About 200 feet up the river, we headed off through the trees to meet up with the ski trail. 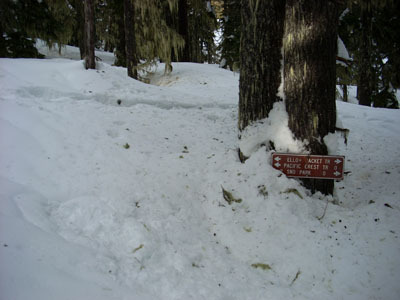 This trail is to take us to the Yellow Jacket trail and to the Pacific Crest trail. After the last heavy snow, we could see no tracks of previous hikers, and were apparently the only ones who have chosen this route so far today. If we can, we stick to the marked ski trails. These trails are marked with blue plastic diamonds nailed to the trees. The object here is to find the first one, on the near side of a large tree. Then, based on the angle of the ones posted on the far side of the tree, you should know which direction to head from there. The theory is that you should see another set of markers from very near the previous set. Then simply just follow the markers. On this occasion, we had a bit of difficulty following this simple plan. 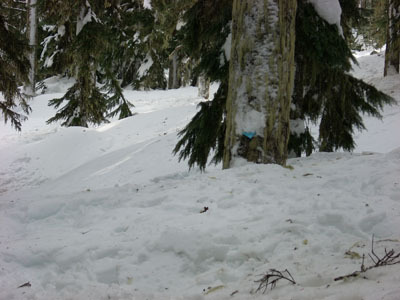 On some occasions, the snow has stuck to the trees in such a way as to obscure the markers making it harder to spot from a distance. 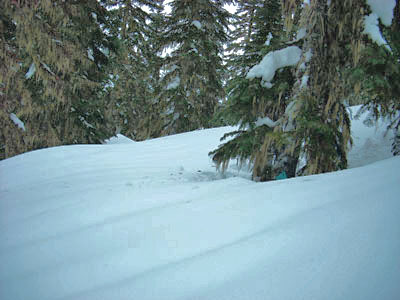 More often, we found that with the heavy snow pack, many markers were at ground level. On two separate sections, we lost the trail completely, we suspect because of covered markers. The marker on this tree is very nearly covered by the high snow level. On those times, using the maps and compass we were able to get ourselves relatively on track. We did however do some wandering (now would be a good time for a G.P.S. ), and eventually stumbled on the Pacific Crest Trail marker. If you look close you will see our tracks heading right past the marker on the other side of that tree, thereby heading off in another direction for a hundred yards or so before making our way back and spotting the marker on this side of the tree. One word of caution, is to steer clear of the larger trees when possible. On days like this one, where the temperatures were above freezing and the sun is out, the snow that has been accumulating on the trees then melts and falls. Mostly as an irritating rain, but sometimes as a larger mass that falls with a wumphf, (like that?) and the big ones can really hurt. 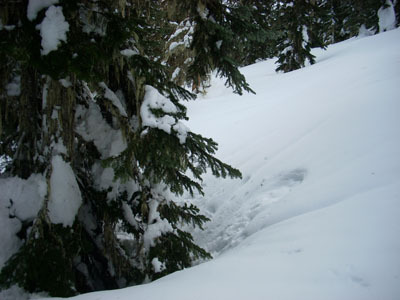 Just as importantly is to avoid the tree wells, with the soft snow, it is possible to fall down into one of these wells. There is a likelihood of injury and it can be very difficult to get out, especially without help. We both carry ropes in our packs for such a possibility. Despite all our wandering in the unmarked territories about White River, we did find a service road on Boy Scout ridge. 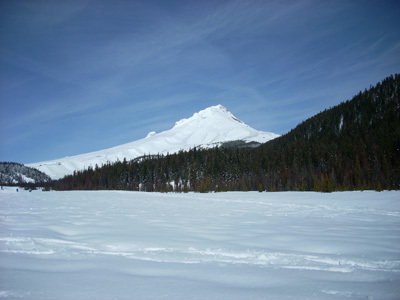 We stopped for lunch in a clearing with another great view of Mt. Hood. We were actually in search of another spot very close by, where I proposed to Honey 4 years ago this week. Didn’t find that spot. But this one was very nice as well. On my last bike ride through Cross park in Gladstone, I stopped by the old bridges to see how they looked in the fall light, their views opened by the bare trees. The water is running high, clear, and no doubt very cold. Each time I go by I hope there there is some sort of activity, giving a hint that progress is being made in repairing the fire damage to the under-structure of this bridge so that we can ride across and easily access southeast Oregon City. But, there is still no such action. This old southern Pacific railroad span sits firm and still just west of the Park place pedestrian bridge. It appears that it is cheaper, and more ecologically sound to let it remain undisturbed, than to remove it. There is no railroad in need of this bridge anymore. This entry was posted in Spanning the Bridges on February 12, 2008 by golinielcomblog. The state of Oregon recycled 2,519,344 tons, or 43 percent of total waste in 2006.Â This is a small increase in tonnage but decrease in percent of waste that is recycled.Â This may be due to the increase in population of the state, and increase in waste generated per capita.Â All the states numbers lead us to believe that, per person,Â we are doing a worse job with our recycling. What can we do about that?Â Here’s just a few simple things you can do. Avoid disposable items whenever possible. Choose to purchase those items that minimize waste in packaging. Tell your coffee shop to keep those plastic lids and other things that you don’t really need and are just going to get thrown away. Use the blank side of scrap paper before recycling it. Invest in some grocery bags made from recycled material and take them to the store. Pack your lunches in reusable containers, and carry them in bags you likely already have at home. My lunch sack is a paper bag covered in duct tape. Build and use a compost bin system. Break the bottled water habit.Â Americans consumed more than 31 billion liters of bottled water in 2006. Making those bottle required 900,000 tons of plastic and emitted as much greenhouse gas as 500,000 cars. Use one container, and refill it from the tap.Â Most cases, the water isnt that different. This entry was posted in Social on February 6, 2008 by golinielcomblog. The kickoff party was last week. The route is revealed, registrations are underway and its time to start making plans. Cycle Oregon is very effective in keeping its secrets. They plan each route more than a year in advance and they keep it a secret until the announcement party. Registration begins at the party after the announcement, and their web site is usually activated at that same time. So, why go to the party? A chance to catch up with old biking buddies that you haven’t seen since last fall. See the new lines of very high end bikes you wish you could afford. Bike booths. This year we got hugs from the girl at the BTA. She was excited we were members, and had lots of good things to say about Alice B Toeclips dinner in March. A close up look a the new “Share the Road” license plates. A very early look at the route, the flyers and, if you are so inclined a bit of a head start in making reservations for lodging in some of the very small towns that this ride stays in. The last time the ride stayed at Wallowa Lake for two days, we got reservations at the Eagle Cap Lodge within an hour of the announcement, and they indicated they were nearly out of rooms already. Gleukos, the new official Cycle Oregon energy drink. Looks like is mostly glucose, citric acid and salts. It comes in a plastic pouch shaped like a bottle, though not sure its package is real bike bottle cage friendly. Paydays. interesting choice for energy bars, and not friendly to those with peanut issues, but I will usually eat anything during bike season. The route for the Week Ride is a mix of routes they have done in the past. Specifically, parts of the routes of 1999 and 2003 covers nearly all of this years route. But it is a beautiful ride, with something for everyone. The organizers are really trying to appeal to all levels of riders with this route including two layover days and mileage options on all days except the first and the last. This years host towns are Elgin, Union, Baker City, Halfway and Wallowa Lake. This means you can ride as little as 275 miles or as much as 463. Not too many miles by Cycle Oregon standards, only one difficult climbing day, by Cycle Oregon standards. But everything else will be up to Cycle Oregon standards I am sure. If you book early enough you can even get the tent service where they set up/take down your tent each day and deliver your bags to the tent. You can find lots more Cycle Oregon stuff on their site. I will talk about the Weekend ride on another day. This entry was posted in Bicycling & Fitness on February 5, 2008 by golinielcomblog. Multnomah County has scheduled a series of town hall meetings to present information on the condition of its Willamette River bridges and a proposal to fund their repair. County Chair Ted Wheeler will share information on the countyâ€™s 20-year capital shortfall of $490 million for its six bridges across the Willamette. Bridge repair needs range from replacing or repairing the Sellwood Bridge to safety improvements such as replacing the open steel grating on the Morrison Bridge. The Board of County Commissioners is considering referring a measure for the May ballot that would increase the county vehicle registration fee to raise funds for bridge repairs. 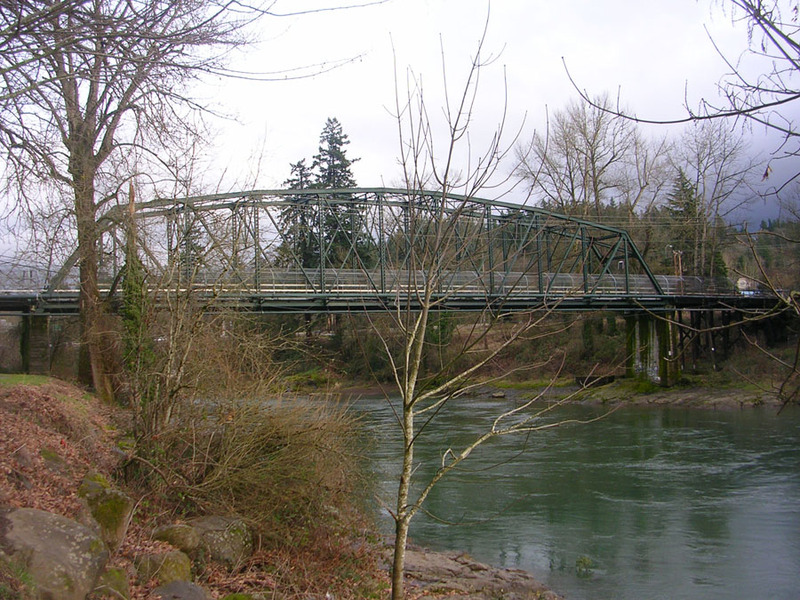 The meeting format will include a presentation, an opportunity for the public to ask questions and share comments, and time to view displays on the condition and repair needs of the Willamette River bridges. 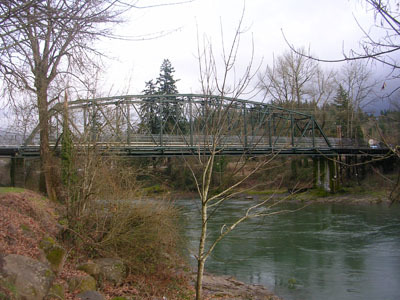 Multnomah Countyâ€™s Willamette River bridges include the Broadway, Burnside, Hawthorne, Morrison, Sauvie Island and Sellwood. The bridges range in age from 50 to 98 years. Each day more than 180,000 vehicles cross the bridges, in addition to an estimated 12,000 bicyclists and thousands of pedestrians. This entry was posted in Spanning the Bridges on February 1, 2008 by golinielcomblog.